Part Used & Method for Pharmaceutical Preparations: The flower buds are gathered in September or March, when the buds turn bright red. Then, they are dried. Functions: 1. To warm the spleen and stomach and direct rebellious qi downward; 2. To warm the kidneys and tonify the yang. 1. Cold in the stomach manifested as belching and vomiting. Cloves (Dingxiang) is used with Pinellia tuber (Banxia) and Fresh ginger (Shengjiang). 2. Weakness and cold in the spleen and stomach manifested as poor appetite, vomiting and diarrhea. Cloves (Dingxiang) is used with Amomum fruit (Sharen) and White atractylodes (Baizhu). 3. Weakness and cold in the stomach manifested as belching and vomiting. Cloves (Dingxiang) is used with Ginseng (Renshen) or Pilose asiabell root (Dangshen) and Fresh ginger (Shengjiang). 4. Kidney yang deficiency manifested as impotence. 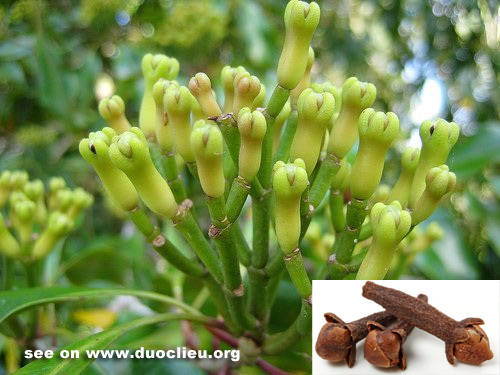 Cloves (Dingxiang) is used with Prepared aconite root (Fuzi), Cinnamon bark (Rougui), Morinda root (Bajitian) and Epimedium (Yinyanghuo). Cautions & Contraindications: This herb should not be combined with the herb Curcuma root (Yujin).